The other day I wrote "Depression at 14" and since then I have been thinking of more ways I could open up and tell you all more about me! 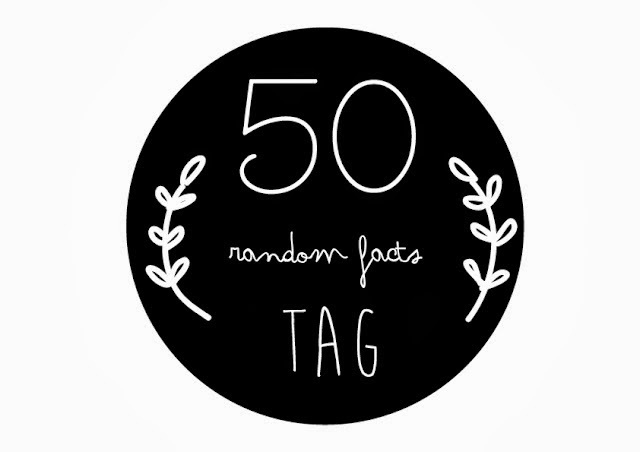 So I figured it would be a lot of fun to do a 50 Random Facts Tag. I have created a linkup if you'd like to join me and pass the tag onto your bloggy friends. 1) My family is from a small town called "Elk Grove"
2) I wanted to be a 23yr old Bride because my mom was a 23yr old Bride. Success! 3) I'm deathly afraid of water because I was tossed off an inner tube at 3 years old. 4) If my sister was watching a Scary movie, I would go sit outside because I was so afraid. 5) My Husband and I met at a race track but first talked at a bar. 6) At 19 I didn't believe in love. At 20 I met my husband and my mind was forever changed. 7) People who believe they are entitled to things disgust me. I despise entitlement. yuck. 8) I'm a National Cheerleading Champion. 9) I'm going to school for Child and Family Development. 10) People think I yell when I talk but I just come from a Loud family. 11) I don't cook. at all. I attempt, but I always end up hating it. 12) To comfortably fall asleep I have to be touching my Husband. 13) I forgive way to easily. 14) I've only kept 3 friendships for longer then 2 years. I'm the worst at keeping friendships. 15) My Sister and My Mom are my 2 Best Friends. 16) I feel like the day is wasted if I don't have a Starbucks. 17) I learned to drive in a Chevy Truck, My First car was a Nessan Sentra, and I currently drive a Kia Soul. 18) I have had every single hair color imagined. 19) I am obsessed with Peter Pan. Obsessed!! 21) I've won an award for "Best Comedic Relief" at least 4 times. 22) I broke my wrist fist fighting my sister on a trampoline. 23) I could eat Kale Chips all day. every day. 24) I associate Sept 13th, Nov 20th, Dec 11th, Jan. 1st, and April 19th with my Husband. 25) I suffer from severe Anxiety. 26) I am a major backseat driver when it comes to my Husband Driving. 27) I'm always the first one to say "I'm Sorry" even if it takes me a while. 28) I hate the beach and yet, I live by the beach. 29) I have an unhealthy obsession with Peach and Sweet Tea. 30) I hate hot drinks, except for Hot Apple Cider. 31) I'm a serious tomboy but I am a total girly-girl. 32) I'm a natural blonde and nobody ever believes me. 33) I'm a total Musical Theatre Nerd. 34) I have a really hard time accepting things and leaving the past in the past. 35) I have 5 tattoos and want more. 36) I hate living in California. 37) I love to travel and want to go to the UK. 38) I get along way better with Toddlers and Dogs then I do with Adults. 39) I treat people how they treat me, not how I want to be treated. 40) I've sang up on stage with country singer, Martina McBride. 41) Christmas is my absolute favorite. 42) I have to have music blasting in my car every time I drive. 43) I can't walk through walmart/target without going to the Makeup Isle. 44) One day I would love to be a published author. 45) I share a birthday with Paul McCartney (The Beatles) and Blake Shelton. 46) I have a 3 Chamber Heart. 47) I am barefoot 95% of the time. I seriously hate shoes. 48) I believe the world is a much better place because of the mountains. 49) I sell Scentsy. and I love it. 50) I cannot stand when people aren't truthfully loyal. I loved this girl! You are so awesome. We have so much in common too. I am with you on the hair color... I have had every color too but I love people on you.